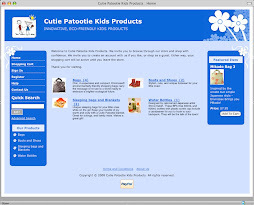 Moms, Cute Babies, and Practical Kids Products. The online journal of an aspiring "momtrepreneur", mother, and a hundred other roles. NEW! Now you can shop online! Now you can shop online! Many of you have emailed me to say that you would love to be able to purchase merchandise online. At long last, you are now able to do this. We can deliver by mail, or if you are a regular RCH customer, you can also place your custom order online, pay and pick up your purchase the next time I am at Royal Columbian Hospital. This makes for a great way to custom order your gift baskets! Visit the online store today at shop.cpbabywear.com! As promised, here's how I got started. To make a long story short, I bought out this guy's inventory of baby merchandise. He had a kiosk in a mall, but then decided to do other things instead, so sold me his entire inventory. I'm still trying to figure out how best to sell it. I've got a ton of stuff, mainly three months to toddler age. This includes baby sleepers, pjs, sleeping bags, soft crib shoes, toddler blankets, socks, and many many shoes! I'll post some photos soon.